Let's put it this way: you're not going to be calling up all your friends to announce that you found Irpex lacteus today. It's a "resupinate" polypore, which is a fancy way of saying it's a bunch of shapeless fungal stuff spread across the bottom of a dead log. 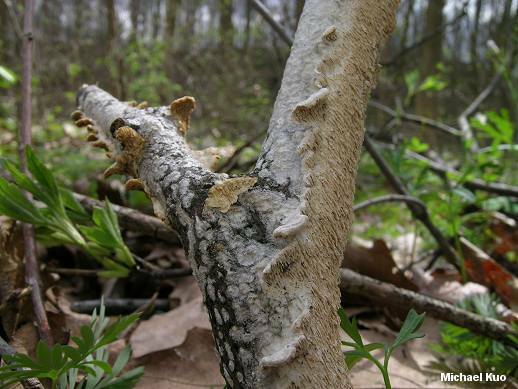 It can be separated from the many other fungal things that spread across the bottoms of logs by its whitish color and (look real close) its tooth-like pore surface. Microscopic analysis will confirm identification, if you care. 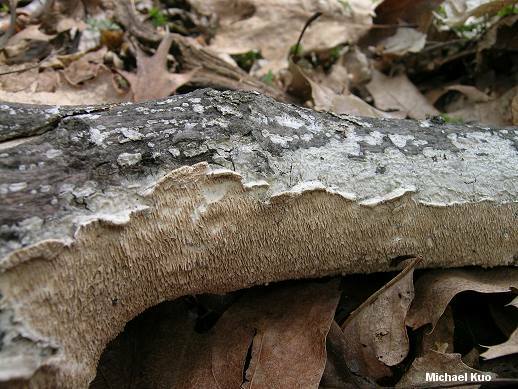 Ecology: Saprobic; spreading across the bottoms and sides of fallen hardwood logs (occasionally on the wood of conifers); annual; causing a white rot of the sapwood and rarely the heartwood; occasionally reported as parasitic on the living wood of cherry trees; appearing year-round; widely distributed in North America but rare or absent in the Southwest. 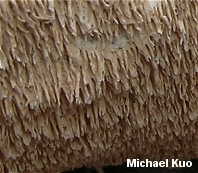 Fruiting Body: A spreading patch of whitish pore surface with 2-3 pores per mm, soon becoming tooth-like rather than poroid, except near the margin; developing shelflike edges or even caps when growing on the sides of logs; caps when present kidney-shaped to irregular, with a whitish to grayish (often zoned), velvety to hairy upper surface; flesh thin, whitish, and tough; without a stem. Chemical Reactions: All parts brownish orange with KOH. Microscopic Features: Spores 5-7 x 2-3 µ; smooth; elliptical to subcylindric; hyaline in KOH; inamyloid. 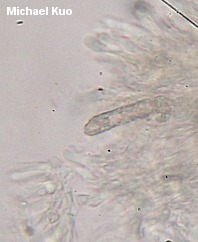 Cystidia conspicuous; abundant to scattered; 50-110 x 5-10 µ; encrusted apically or over nearly the whole length. Thin-walled generative hyphae frequently branching; 2-4 µ wide. 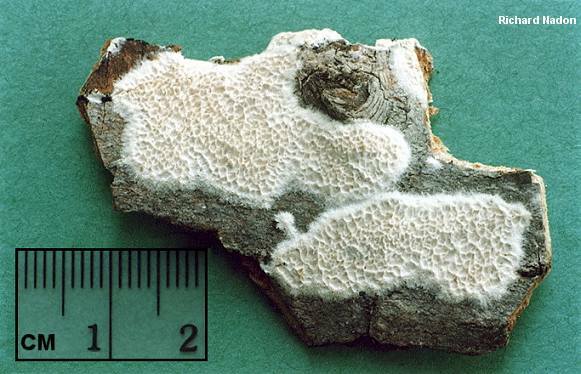 Thick-walled skeletal hyphae rarely branching; 2.5-6 µ wide. Clamp connections absent. REFERENCES: (Fries, 1818) Fries, 1828. 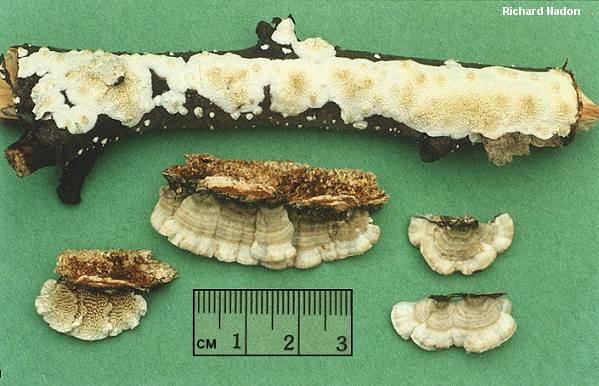 (Saccardo, 1888; Overholts, 1953 [Polyporus tulipiferae]; Gilbertson & Ryvarden, 1986; Arora, 1986; Phillips, 1991/2005; Lincoff, 1992; Roody, 2003; McNeil, 2006; Binion et al., 2008.) Herb. Kuo 04010702.